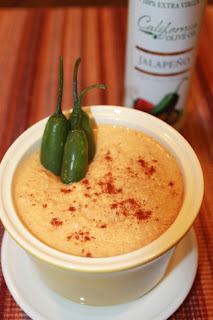 I’ve made jalapeno hummus before by pureeing some roasted jalapenos and adding them to the chickpeas, but it didn’t give me the kick I wanted. This, however, THIS has a kick. This oil is amazing. The aroma alone will kick you in the senses and it just begs to be drizzled on everything. Combine all ingredients, except the chickpea liquid, in a food processor. Blend as much as you can. Slowly add the chickpea liquid until the hummus is smooth and well combined. You may not need all of it, or you may need more. Taste and adjust seasonings. Hummus is a great, healthy snack with carrots, cucumbers, red pepper strips, pita bread, crackers and anything else that’s dip-able.